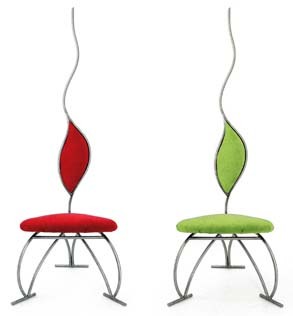 I don't usually buy into a manufacturer's hype, but the people at Szado describe their Noël chair this way: "In red it is the flame of passion. In green it is the bud of new growth." And looking at the chair, I get it. However, the Noël in any color doesn't look particularly comfortable, and even Szado wisely bills it as a "piece of art." And I suppose as art goes, $2,100 - $2,250 is not terrifically expensive. When I picture myself squirming to find a comfortable seating position on this chair, though, their marketing line "it can also create an outrageous dining experience" may not be working quite the way they intend.